The Northern Ireland Raptor Study Group, founded in 1991, is a network of voluntary raptor fieldworkers who monitor and record the fortunes of birds of prey across Northern Ireland. We collect information by visiting known raptor breeding and wintering sites each year to check for occupancy and to record the status, distribution and breeding success of each species. We also visit previously un-surveyed areas to search for and to document new sites. 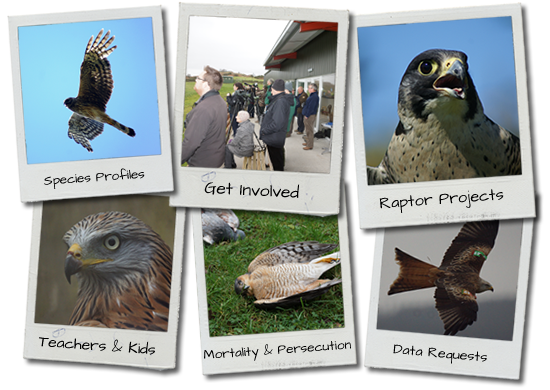 We promote and encourage the conservation of Northern Ireland’s raptors by working in partnership with many others including landowners, statutory agencies, industry, academic researchers, educators, raptor rehabilitators and non-governmental organisations. The species we monitor include peregrine falcon, hen harrier, buzzard, merlin, kestrel, sparrowhawk, goshawk, red kite, white-tailed eagle, golden eagle, barn owl, long-eared owl, short-eared owl, marsh harrier, hobby, honey buzzard and osprey.